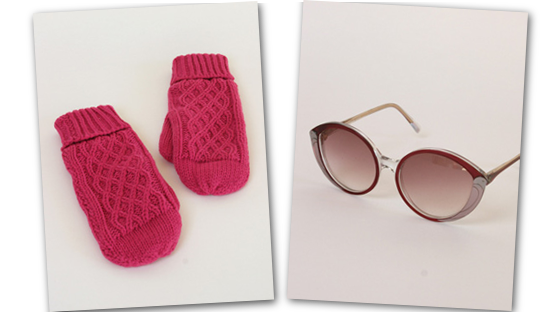 Hot pink cable knit mittens and sunglasses with a swooping bird like motif. 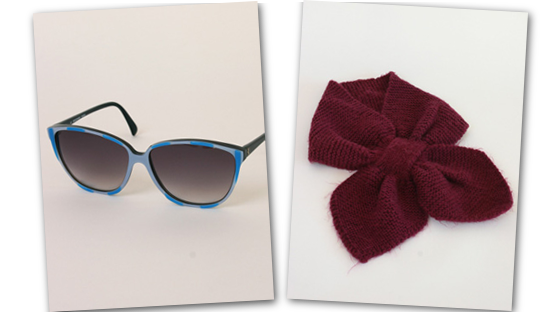 Electric blue sunnies and claret colour hand knitted scarflette. All the sunglasses I added this week were from a small stash I unearthed on my recent trip to New York. They’re all vintage deadstock from the late 70s/80s, handmade in France and in a fun variety of eye popping colours and seasonal colours like claret. Above is an electric blue stripe pair that would look cute worn with this beautiful hand knitted mini scarf which I’ve coined a “scarflette” – you pull one end through the gap near the other end and it holds together looking like it’s been knotted but it lays flat. So clever! 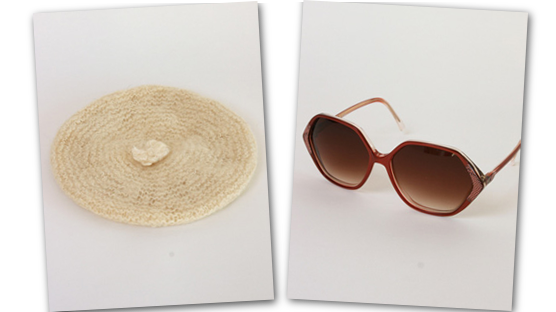 Hand knitted wool beret and burgundy sunnies. I’m a real sucker for a vintage hand knit and a big fan of the beret so this cream wool hat ticks all my boxes. I would wear it with these sultry burgundy sunnies that have a little printed snakeskin pattern in each corner. 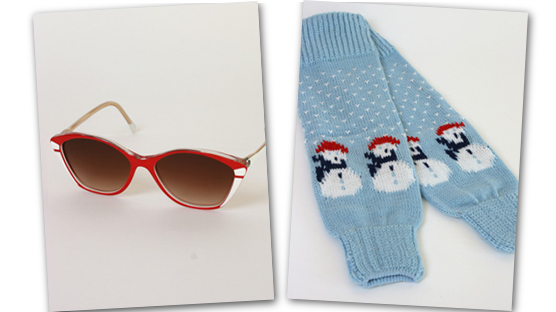 Cherry red sunnies and icy blue snowmen legwarmers. I still like most things I wore in my Twenties apart from leg warmers. I used to LOVE them, now I’m not so sure. I *do* make an exception for the pair above though because 1. they have little snowmen on them 2. they’re in an adorable shade of icy blue 3. they’re actually children’s leg warmers so they have a skinny fit. Wear with these colour pop cherry red sunnies. Jasmine soup bowl and knitted turban. Autumn also heralds the return of the soup season! Pack away those lunch time salads boys and girls and start cookin’ up some of the homemade hot stuff. Yum. I have two of the prettiest soup bowls on the planet in the Kitchenette collection. They’re called Jasmine by Woods; they have 2 little handles, a matching saucer to catch drips and they’re in the most sublime shade of lemony yellow. 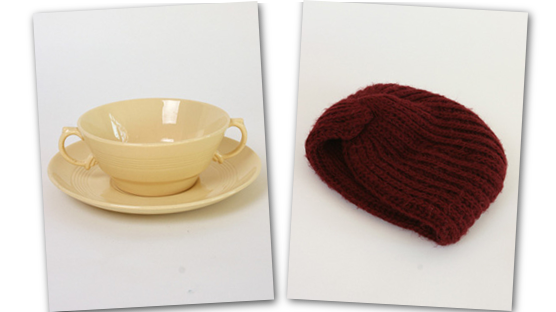 Slurp your soup looking all sophisticated wearing this handmade knitted turban – why settle for an ol’ bobble hat? Wicker basket and wicker picnic hamper set for two. Of course, we’re all hoping this sunny crisp weather continues into November. 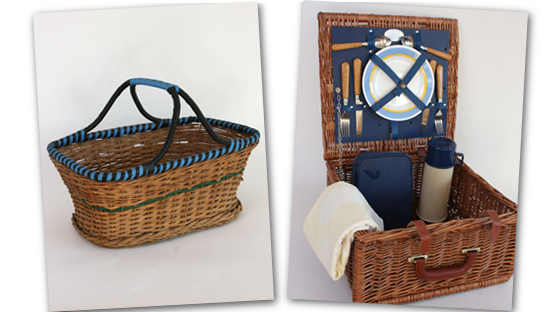 If so this picnic set and wicker basket will come in handy for wintry picnics in the park. Wrap up warm, take a big tartan rug and fill the Thermos with mulled wine! I also use picnic sets and baskets to take food and drinks to friend’s parties during the festive season. This weekend I’ll be filling my picnic set with pumpkin pie, spiced apple cider and candy sweets for a Halloween house party. All I have to do now is sort out a costume……. help!